Late-night talk-show hosts already commandeer your living room in the wee hours. Now they're expanding their purview. Following Jimmy Kimmel's bit before Sunday's Oscars in which he pretended to climb through the camera into a couple's living room to berate them, today we have this new Time Warner Cable ad starring Jimmy Fallon—in which the Tonight Show host shows up (with his whole band) in a guy's home just as he's eating breakfast. The point: Now you can watch NBC shows anytime as part of TWC's on-demand services. 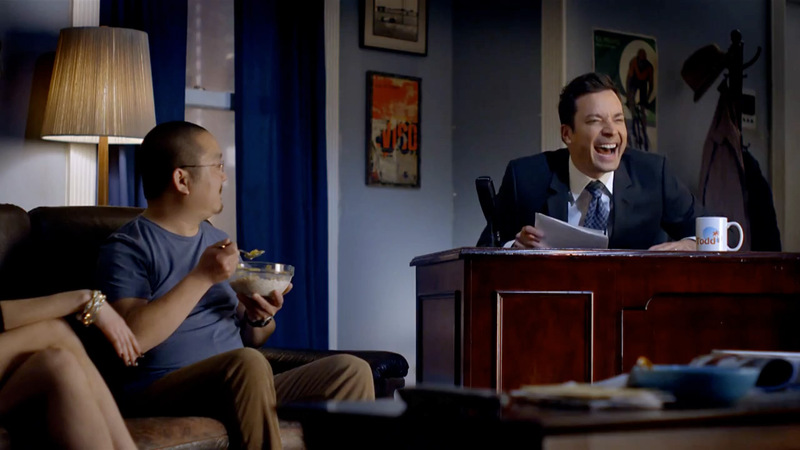 Fallon is already everywhere these days; it only makes sense that he should be there anytime as well. He even popped up briefly in Ogilvy New York's previous ad for TWC—the minute-long extravaganza, also posted below, hosted by Diddy.